What is a smart home sensor? Many aspects of your home’s environment operate in the background. Without you knowing or thinking about it, water flows through your pipes, gas enters your home, and smoke detectors monitors the air for signs of a fire. Because all this happens behind-the-scenes, you assume it’s all working well until things have gone drastically wrong. Smart home sensors connect you to the inner workings of your home. They take your home’s most basic and necessary functions and move them online for easy monitoring. As a result, they can quickly and easily diagnose problems in your home that too often fall under the radar until it’s too late. Why buy a smart home sensor? What if you could gain insight into some of the quieter operations happening in your home? And what if having those insights could lead to surprisingly high monetary and energy savings? By investing a little bit up front, you can see huge cost reductions down the road. Savings are always great, but peace of mind is another big reason to invest in smart home sensors of any kind. Nearly all home monitors have the ability to connect to mobile devices, giving you instant feedback about your home. If something goes wrong, like a spike in harmful particulates in the air or a water pipe leak, you will know almost instantly. Having smart home sensors that keep a careful eye on your living spaces means you can relax and let technology worry about your home for you. What smart home sensor features are important to consider? Smart home sensors are a diverse product group, and thus have many different features that you might want to keep an eye out for. Because of the diversity of product types in this category, knowing which services your new smart device offers is crucial. For example, some smoke detectors may also detect other toxins, which means you don’t need to buy two separate devices. In general, smart home sensors may offer more than one home function, and it’s worth your time to seek out the device (or devices) that fulfills your needs. If you want remote control of your home systems, you should look for a smart home sensor that can connect to your WiFi and transmit data. This option also enables you to receive real-time and summary data wirelessly, which lets you see how your home devices and systems are running from anywhere, at any time. The ease of installation will depend on the type of monitor you choose for your home. Many devices will require calling your electrician to help with an installation. Depending on the smart home software you use (Apple HomeKit, Amazon Echo, Samsung SmartThings, etc. ), your smart home sensor may be able to access features such as voice control and alerts that are built into your smart hub setup. The Protect, at its core, is an advanced sensor capable of detecting both smoke and carbon monoxide in your house. When it detects something isn’t right, it will tell you, both vocally and with an alert to your smartphone, where you can shut off the alarm. The Nest Protect has many smaller, unique features that add to its appeal. At night, the Protect doubles as a light by sensing motion below and dimly lighting up a dark room for visibility purposes. The Protect also links to Nest thermostats and can turn off your heat if there is a carbon monoxide leak or smoke in your house for additional safety. If you are looking to get smart about home safety and monitoring, the Nest Protect is a proven, easy to use device that will provide peace of mind and professional-quality safety. Finding standing water in your home can be a nightmare. And no matter how much water is you find, you’ll always wish you had discovered it earlier. D-Link’s Water Sensor notifies you about flooding in your home as soon as it happens, enabling you to take appropriate action to minimize home damage and expensive repairs. The Wi-Fi Water Sensor has a unique water sensing method that can cover more area and send you alerts as soon as the water starts pooling. More traditional water sensors use a couple metal probes that detect increased conductivity. 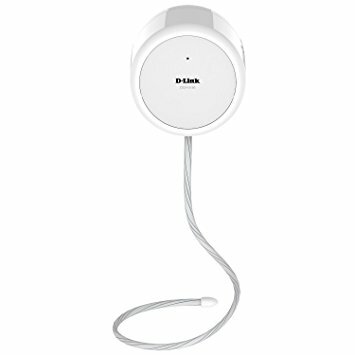 D-Link’s solution is a long cable with embedded probes that can be run along the edge of a floor or around the perimeter of a laundry room. The sensor plugs directly into outlets and connects to WiFi, so when the probes come into contact with a pool of water you’ll receive an alert on your phone instantly.